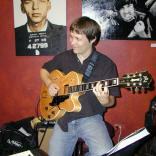 After years of playing and teaching in and around his hometown of Karlsruhe, Germany Chris attended the Munich Guitar Institute where he received a Diploma in Jazz and Rock Guitar. While in Munich he studied with Artists in Residence such as Frank Gambale and Paul Gilbert. In 1995 Chris began his studies at Berklee College of Music in Boston, Massachusetts. While at Berklee he had the privilege of studying with and/or performing with greats like Jerry Bergonzi, Bruce Saunders, Mick Goodrick, Jon Finn, Wayne Krantz, John Scofield, Mike Stern, Jim Kelly and Many others. After graduating in ’99 Chris became part of the east coast performing and teaching circle. In addition to teaching around 60 students a week he was busy performing with his Jazz Trio „The Chris Zahnleiter Group“ as well as doing musical theater work and tours with internationally acclaimed artists. In 2001 he recorded and produced the CD „Eight Standards“ with „The Chris Zahnleiter Group“. In 2006 Chris relocated to the Phoenix, AZ area where he continues to be busy teaching and performing as well as furthering his own musical horizon.